Those of us who survived the year 2017 with our minds and bodies mostly intact might not have much to show for it, cinematically speaking. Throughout the last 12 months, it often seemed like there wouldn’t be enough quality movies to fill out our annual top ten at all. But the usual amount of festival holdovers and winter debuts helped bring our poll to a mildly rousing conclusion. Ultimately, there was enough passion to go around to make the film in our number one slot a surprising landslide selection, sitting very comfortably in the lead—in fact the title of that film defines its unexpected come-from-behind placement. Otherwise on the list, we have some films you may have heard about: a frank and complex gay love story, an exciting breakthrough from an important new female filmmaker, a fleet drama about young people in over their heads committing violence, an exhilarating story about the precariousness of childhood performed by a vital cast of young newcomers, a brilliantly conceived tale from a cinematic whiz-kid taking place in three discrete space-times. But no, we’re not talking about Call Me by Your Name, Lady Bird, Good Time, The Florida Project, or Dunkirk—top picks in most other polls, and which didn’t quite crack our list. We’re glad to point you toward some films that thrilled us, often because they existed outside of trends and consensus. As always, our films were determined by soliciting top tens from our frequent contributors from the past year. Each writer’s top-ranked film received ten points, their second getting nine points, and so on. 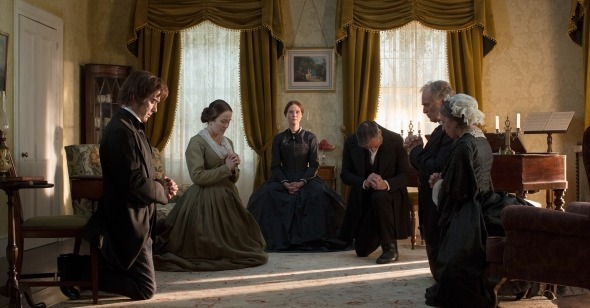 Though they are separated by over a century, as well as an ocean, their gender, and their principal artistic medium, Emily Dickinson and Terence Davies, the British filmmaker who reimagines the American poet’s life so brilliantly in A Quiet Passion, have much in common. Both have suffered from being woefully underappreciated by their contemporaries, and both have deep attachments to family, soul-stirring conflicts regarding religion, and deep skepticism, bordering on hostility, towards the mundane trappings of their social environments. Perhaps this explains how Davies manages to create such a sympathetic and human portrait in his elliptical and intimate biopic. As embodied with wit, intelligence, and vulnerability by the astonishing Cynthia Nixon, A Quiet Passion’s Emily is neither a dreary recluse nor simply a tortured artist. She steals late nights to write her poems; hurts at bad reviews; weeps for dying parents; flirts with a married pastor; rages at an unfaithful brother; dotes on a beloved sister; and scolds her family’s servants, then begs their forgiveness—all with the strident self-confidence and thinly concealed vulnerability of a genius made of flesh and blood.